Are you old enough to remember birthday parties in the good old days? The days of birthday parties BP (Before Pinterest). I remember them: Moms and dads would order a pizza and blow up a couple of balloons, which is all they could manage before they would get so light-headed they had to sit down, and they would bake a cake from a box. It was simple and effortless. 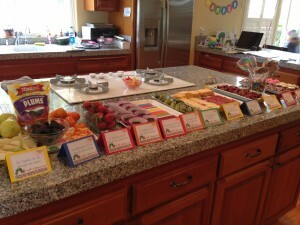 There were no goody bags or giveaways; just Hostess, paper streamers, and store bought sugary goodness. 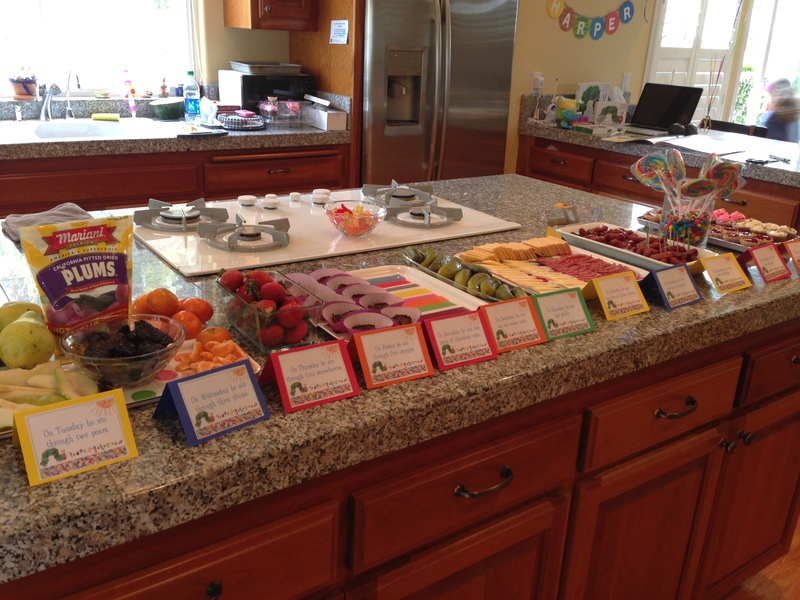 But now, thanks to Pinterest, birthday parties have been taken to a whole new level. Prior to joining the popular website, I had broken out in a few rashes of coo-coo party planning. One Halloween, I remember seeing some great ideas on Disney’s familyfun.com and started turning string cheese into monster fingers, apple slices into scary snaggle-tooth finger foods, and inverting two Bundt cakes to create a jack-o-lantern. 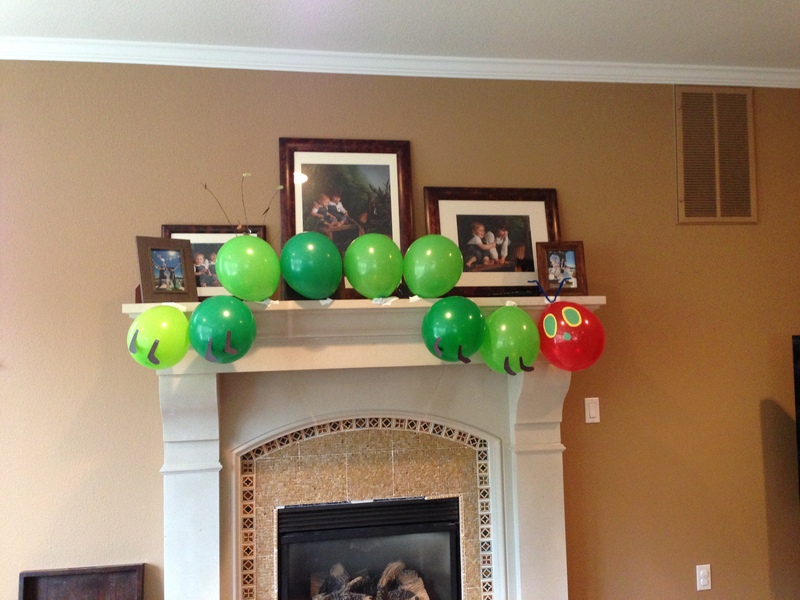 But all that was mere child’s play compared to the things I have seen on Pinterest. And as if I needed another reason to feel inadequate, there congregated on Pinterest are the over zealous, financially well-endowed, party planners of the world who are seemingly united there just to give me, in addition to their good ideas, party planning shame. Once you join Pinterest, you create bulletin boards that friends can follow or like. You can pin recipes, ideas, quotes, and all sorts of things to your bulletin boards as well as look at other people’s ideas. Shortly after joining, I would get emails from Pinterest saying people were now following my boards. Which made me very insecure because I haven’t had the time to make them good enough for me to be happy with people following them in the first place. When Harper’s first birthday came onto my radar, I somehow got it in my head to throw her a big party. My baby was turning one! 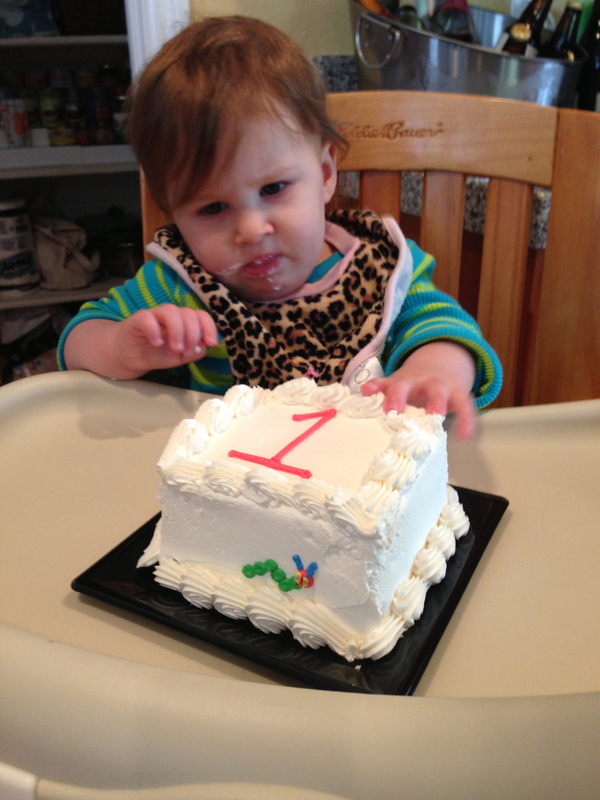 Although, we’ve always celebrated our children’s birthdays with a party or celebration of some kind, only Olivia had a big first birthday party that included more people than just our immediate family (FYI: she currently is the only one with a baby book too. Shhh!). After talking to my husband, we decided since Harper was our last baby it would be fun to host a bigger party and invite friends and their families. We are involved in a big playgroup of babies and we invited them. 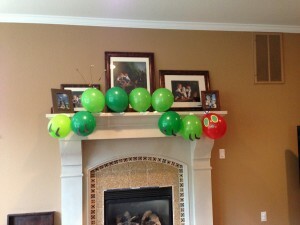 As I began thinking about her party, I decided to look on Pinterest for some ideas (Big mistake, huge). 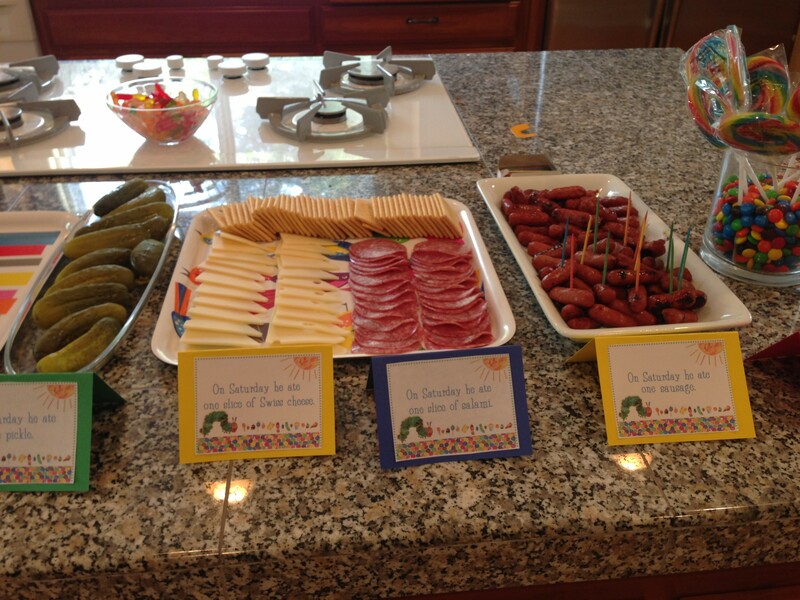 Going on Pinterest to get birthday party ideas is like going on Web MD to check out your symptoms. You’ll walk away convinced you have ADHD. I saw so many amazing ideas and I was overwhelmed with how to materialize them. Key word: materialize. 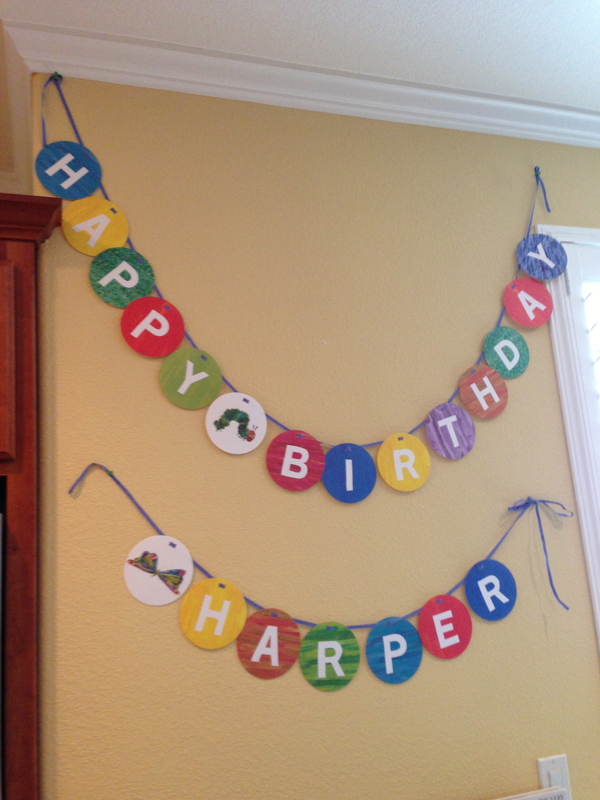 After spending way too much time looking at various party ideas, I ended up deciding on using the Very Hungry Caterpillar by Eric Carle as a theme for Harper’s birthday. 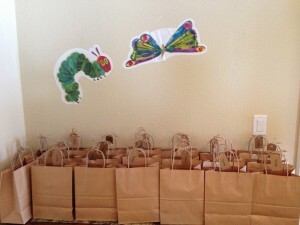 Next thing I knew, I was at Craig’s Warehouse buying balloons to make a caterpillar, ordering a cake, and planning the food (based on all the food the caterpillar in the book ate for each day of the week). I then ordered some Very Hungry Caterpillar decorations from Amazon and caterpillar arts and crafts from Oriental Trading Company. The day of the party I swung by Raley’s to pick up the cake and was pleased by the amazing job they did hand drawing a caterpillar in icing on the cake. 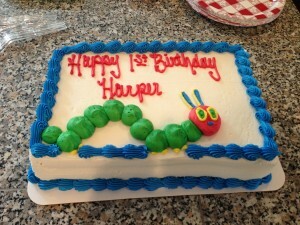 We even ordered Harper her very own cake square with a tiny little caterpillar on it. I arranged the food and put out the goody bags for the guests. For goody bags, each kid got a plastic plate set from IKEA (which only cost $1.32 per person minus the cost of a panic attack trying to get out of Ikea’s mouse-trap layout and gasoline to and from Emeryville). Despite the fact that I almost lost an eye when a balloon exploded in my face as I blew them up to make the caterpillar, it was a fun theme to commemorate Harper’s first trip around the sun. Ultimately, my tone-downed version (trust me honey it was!) of a Pinterest inspired party, lead to a great time for all of us. My eye eventually healed and at the end of the day, thanks to Pinterest, I could call it all a success! Happy 1st Birthday Harper!